A deep dive (by our low standards) on the Israel/UN situation, Trump’s Overconfidence, and New Year’s Resolutions. 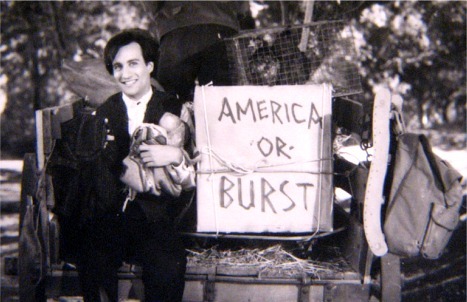 Plus extra Balki! Auld Lang Syne means old times or times long past. I don’t think I’ve ever seen anyone actually sing that song outside of George Bailey or Harry Burns and Sally Albright. However, this year, as the ball dropped, this song’s message was on my mind. Throughout 2017, I will remember times long past and what we are capable of doing to each other unless enough people resist. There Are Russian Spies Here? I realize I’m making a very dated Perfect Strangers reference here and that I’m disparaging the fine folk from the fictional country of Mypos in both the headline and the picture. My justification is that since I’m sending you really terrible information on New Year’s Day, you deserve at least a little joyto start 2017. Plus I need to start rationing all of my 80’s Russian references as we’ve got four long years coming up. In retaliation for attacking the United States by hacking into the servers of its political parties, President Obama expelled 33 Russian diplomats and their families this week from Washington D.C. and San Francisco. Apparently, like booze in Chicago during prohibition, we always know where the Russian spies are, but we just don’t do anything about it – primarily because Russia could do the same to our spies over there. Take a moment to take that comment in. This is the President-elect siding with another country’s leader against the White House. It’s not even an ally like Canada or the UK, but Russia, which currently stands accused of attacking the U.S. Not only that, Russia stands accused of attacking the U.S. in order to help Trump win. You think that would give Trump pause in praising Putin. The lesson here we all need to learn is nothing gives him pause. As a reminder, right-wing media said Obama was treasonous for bowing to the Japanese emperor as sign of respect. Many readers of The TrumpShaker have asked for clarification on what is going on with the controversy surrounding Israel. I don’t have the time (or knowledge) to start from the book of Exodus, so let’s just focus on the most recent developments. I’m sure I will offend someone for using inexact terminology or for getting some technicality wrong. However, here are the broad strokes according to this free newsletter you get. Since 1967, Israel has had some level of control over the West Bank and the Gaza Strip. These are two densely populated areas with a primarily Palestinian population. Israel acquired these lands (and others) in the ’67 Six-Day War. These two areas are also super inconveniently located on either side of Israel, making connecting them into one country or territory, problematic. For decades, just about every U.S. president has tried to make peace in the Middle East happen. There is still a wee bit of work left. The general understanding among world leaders has been that resolution between Israel and the Palestinians in these territories will someday involve creating two states. This is known as the, wait for it, two-state solution. A part of this solution is that the city of Jerusalem, which everyone loves so much that since the dawn of time it’s been destroyed twice, besieged 23 times and captured/recaptured 44 times, would be the capital of both countries or there would be some visitation rights where Jerusalem lives with Israel during the week and goes to see Palestine and Palestine’s new boyfriend Todd on the weekends. It’s not clear to me what a one state solution would look like as it means that Israel absorbs the West Bank and Gaza. This would lead to either Israel remaining a democracy, but with Jews as a minority, or the Jewish population continuing to rule in some sort of apartheid state. Since ’67, Israel has been building settlements in the West Bank, basically putting a claim to the disputed land. Most of the international community believe that expanding these settlements makes the two-state solution less viable. Israel’s building has accelerated recently as the Israeli government has shifted to the right under Prime Minister Benjamin Netanyahu. The U.S. has been a strong defender of Israel over the past 40 years in the United Nations, which despite creating the country has not been a particularly loving parent. Israel is often held by the U.N. to different standards than other member states. The U.S. has in the past occasionally critiqued the settlements as being an obstacle to peace and backed a two-state solution. The U.S has generally tried to appear as an even-handed mediator (while ensuring the security of Israel) and did things like place the US embassy in Tel Aviv, rather than Jerusalem, to maintain that appearance. Israel has long enjoyed bipartisan support. Republican support has significantly increased with the war on terror as well as growing evangelical support for Israel. Evangelical support for Israel is so high because, among other reasons, Israel has a starring role in The Battle of Armageddon. I’ll admit that with Trump’s election, inspirational artists being called to the heavens, and Israel again at the center of world conflict, I am getting a real End of Days or at least Omen III vibe. Okay, so there’s your junior high level primer. Here’s what’s happening now. Trump has nominated bankruptcy attorney David Friedman to be the U.S. ambassador to Israel. Mr. Friedman supports settlement expansion, would like to move the embassy to Jerusalem, and called the U.S. Jewish lobbying organization, J Street, that supports the two-state solution “far worse than kapos.” Kapos were Jews who supervised other Jews in Nazi camps. All this to say, his delicate touch is exactly what the Middle East needs. The United Nations recently passed a resolution condemning the Israel sentiments. Rather that vetoing the resolution, as it often done in the past, the U.S. abstained, letting it come to pass. This enraged Israeli Prime Minister Netanyahu and many Republican and some Democrat leaders. They accused the Obama administration of abandoning Israel (ignoring $38 billion in military aid the Obama administration finalized this fall). Secretary of State Kerry made a speech later, that some are calling the eulogy for the two-state solution. Kerry expressed frustration at Israel’s lip service to a two-state solution while taking actions that make it an impossible solution to realize. Trump, being Trump, took the opportunity to again join with a foreign leader against the White House. He tweeted, “Stay strong, Israel, January 20th is fast approaching.” Prime Minister Netanyahu tweeted basically this 🤗 in response. Got all that? In summary, Trump’s sending a lighted match to a gasoline soaked Middle East, Israel is quickly being added to the long list of partisan issues in the United States, and Trump is again publicly more supportive of another country’s leader than our own. Please read the articles below for more detail and better writing. I think we ought to get on with our lives. I think that computers have complicated lives very greatly. The whole age of computer has made it where nobody knows exactly what’s going on.We have speed. We have a lot of other things but I’m not sure you have the kind of security that you need. But I have not spoken with the senators and I certainly will be over a period of time. Just a reminder, this is the President-elect, the same person that spent half of a decade claiming President Obama was born in Kenya, telling the country to ignore an attack by a foreign country. Oh, also, he has obviously no idea what he’s talking about. Do You Hear the People Sing? Last week, some Rockettes risked their careers and spoke up against performing at Trump’s inauguration. This week, The TrumpShaker salutes the member of the Mormon Tabernacle Choir who quit rather than perform. Read her letter here. It takes this sort of courage and sacrifice from millions to resist the direction that Trump and his people want to take our country and our world. Tales from the Cabinet of Doom – I haven’t talked about it for a couple of weeks, but don’t worry, nothing’s changed, the Trump’s appointments are still horrific. Interior Secretary – Rep Ryan Zinke of Montana (who Democrats are not likely to reject since he would have been a big threat to take a Montana Senate seat away from the Dems) is alleged to have been guilty of travel fraud when he was a Navy SEAL. In other words, he’s alleged to have stolen from the government. This would normally be a huge deal, but since some George Bluth-esque light treason may be on the table for other Secretaries and the President-elect, we’re not hearing anything about it. National Trade Council Chair – Trump selected UC Irvine economics professor Peter Navarro to lead the President-elect’s new National Trade Council. I know what you’re thinking, “Wait, is this someone with actual applicable experience? What’s the catch?” Good question, you’re learning. 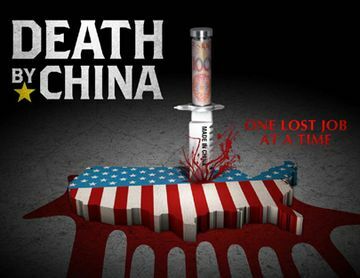 Here’s the poster from the professor’s documentary on trade . . . ta-da! Despite not taking office yet, the most exalted one has claimed that all economic good derives from him. He ignores little facts like Consumer Confidence was at 37.7 when Obama took office and had risen to 109.4 before Trump won. Another inconvenient truth is that 24% of the stock market gain since his election has come from Goldman Sachs alone. The same Goldman Sachs he tarred Hillary with but now taps to stock his cabinet swamp.The most interesting note though – well nothing is more interesting than the President-elect thanking himself – but the most interesting sane note is that consumer consumer confidence has changed by about 20% for those under 35 as well as for those over 55. The punch line is that confidence is down 20% for millenials and up 20% for the boomers. We’re living in different realities. In the article “How to Save the World”, published on sports website Deadspin (because you can’t escape Trump anywhere), Will Leitch powerfully describes the work we must do to make those that just want to ignore what is going on pay attention. Whether the press will be an effective check on Trump’s power or a tool to consolidate it will be answered in 2017. In “Winter is Coming”, Jay Rosen discusses how bad he thinks things are for the press. Spoiler alert: it’s Ned Stark in King’s Landing bad. Organized by Obama campaign and staff alumni, Rebuild the Hope, is doing the grassroots organizing necessary to focus efforts of those ready to resist. Their first efforts appear to be on saving the Affordable Care Act. Check them out! Sarah Kendzior is a journalist who lives in St. Louis, but has covered authoritarian regimes around the world. She has been shouting for months that Trump is an authoritarian. Drawing on her experience, she made recommendations to all of us just 10 days after the election. I have never lived through what we may soon encounter in 2017. Following her recommendations means I am preparing for a world that even yet I can’t truly imagine. However, given her expertise and what has happened in the days of auld lang syne means I should. Oh man, that’s a tough way to end this issue. Here’s Balki again. Previous Post:Vol. 6 – Day 47 P.E. Next Post:Vol. 8 – Day 60 P.E.